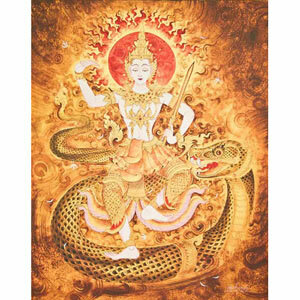 Pakaphong Thongkaing depicts a Deva riding a snake. In her hand, the angel holds a sword, symbol of the wisdom of discrimination, which cuts away ignorance. A red sun shines in the background. 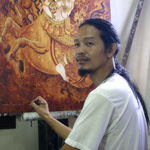 The artist paints the scene with acrylics and signs his name in Thai at the bottom of the painting. 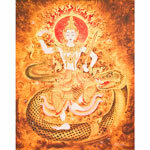 Pakaphong explains: "In the old days, Thai people strongly believed in the zodiac. They used the signs of the zodiac, represented by animals, to foresee newly born people personality, strengths and weaknesses. These animals were often painted on murals in temples. It preserved the belief and reminded people of their own animal sign and personality. I often depicted these animals on the temples walls. Here I present them in my own styles. Snakes are said to be cheerful, moral, wise, sympathetic, optimistic, intense and passionate. They have a rich source of inspiration and understand themselves well. They are also people of great perception."